Today at exactly 8:00 am Promoting Regional Opportunities for Enterprise and Livelihood Development (PROPEL) activities was launched in Pasig City Hall ground. The affair was headed by Secretary Gregory Domingo, Department of Trade and Industry (DTI), Mayor Robert Eusebio, Pasig and members of the Pasig Chamber of Commerce and Industry – a local chamber of Philippine Chamber of Commerce and Industry (PCCI). Alongside the launching of PROPEL 2011 is DTI’s Diskwento Caravan – a program that offers discounted consumer products for the buying public. This program aims to give an alternative market amidst the rising prices of products and services. 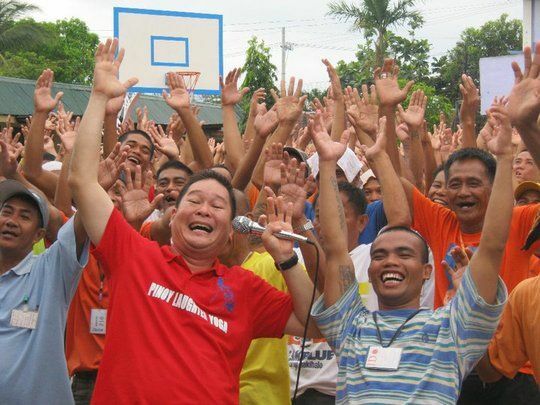 The Caravan and PROPEL activities will go around the country’s local government offices. 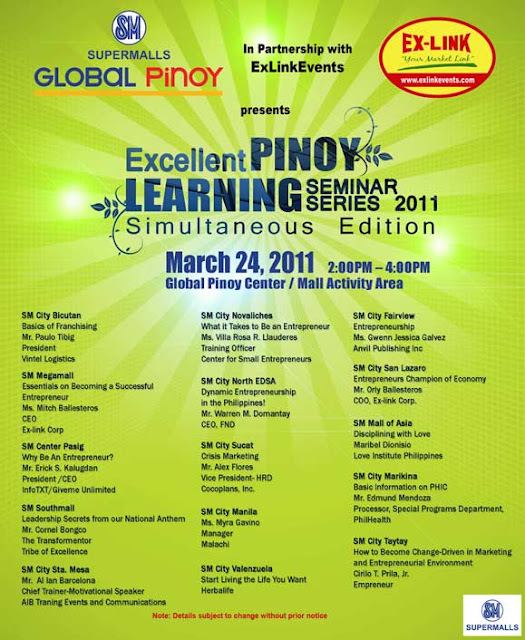 Tomorrow around 16 SM Malls will give a free entrepreneurship seminar at their activity areas. The event will start at around 2:00pm onwards. Successful entrepreneurs will give the talk and share the importance and trade secrets of how to be a successful entrepreneur. SM Global Pinoy members and OFW families attending the event will surely get a lot of practical and easy to do tips and learnings from speakers. Besides the free entrepreneurship seminars, a lot of other educational and entertaining activities are lined-up for the visitors. The event is a partnership of EXLINKEVENTS – an event management and tradeshow organizer in the Philippines, and SM Global Pinoy. If you want to jump start your entrepreneurship dream, we will see you tomorrow at any SM Malls around Metro Manila. There are a lot of events, tradeshows and exhibition you should not miss. 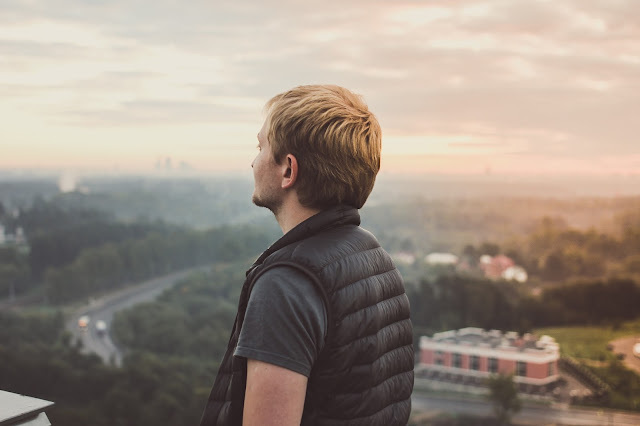 The first quarter of the year is about to fly away and you have nine more months to increase and capture more clients and partners in the events, tradeshows and exhibition. For our organization the first month of the second quarter is the moment of the truth as it is the first month where our first event rolls-out and after that all of our months are filled with implementation of all the scheduled events, tradeshows and exhibitions. We are running with adrenaline and excitement as we give life to all the events that we planned and try harder to deliver what the events, tradeshows and exhibitions promised to the participants. Here are the events, tradeshows and exhibitions you should join (the list will still continue to grow as some of the events that we are about to manage are under negotiations, but I will keep you posted with it). Whew! Things are really getting tight but exciting. 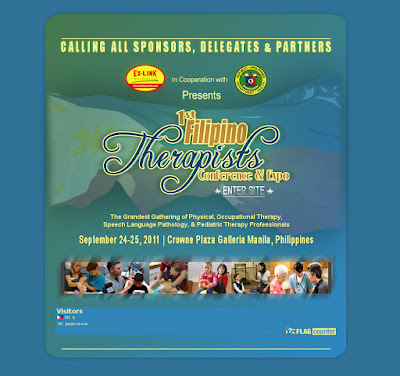 Indeed we are one of the event management and tradeshow organizers in the Philippines that you should partner with. We produced and partnered with associations to deliver with you events that will matter in making your products and services closer to your target market. Events are tools that will give you an edge in creating stronger and meaningful relationships with your target market this year and we have the events to make this happen. Also, if you would like us to handle your events we are still hunger for more events to put into life, do not hesitate to call us if this is your case. Intermed Marketing Philippines maker of Cherifer Multivitamins joins “Look and Feel Great Expo” slated this April 15-16, 2011 at the Market Market, Taguig City. The participation of Intermed Marketing Philippines will give additional value to the event because of its quality products. 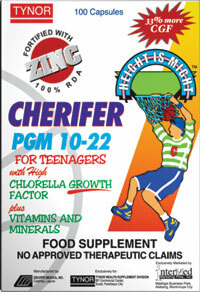 Cherifer is one of the leading multivitamins used by Filipinos and a brand name that offers different multivitamins products from different segments of the market. Intermed Marketing Philippines is a dynamic company with breakthrough market-leading pediatric products with a vision of leading the way to a taller, smarter and healthier generation to come. 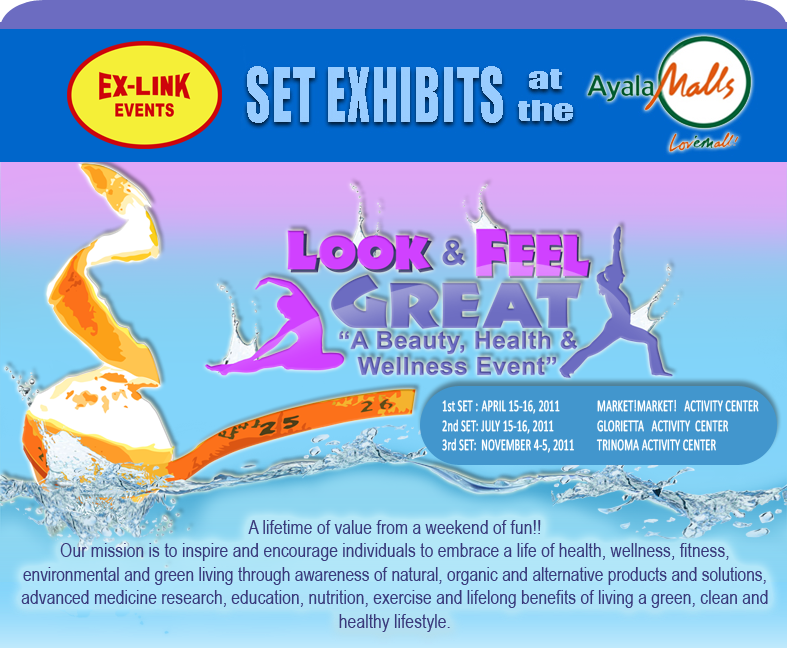 Look and Feel Great Expo is organized by Ex-link Management and Marketing Services Corp. – an event management and tradeshow organizer in the Philippines. As an events management and tradeshow organizer in the Philippines Ex-link Management and Marketing Services Corp. has 10 year of experience in organizing and producing its own events. Look and Feel Great Expo is the only beauty and wellness event in the country that is toured around Ayala Malls in Metro Manila and Pampanga on different schedules. The aim of the event is to promote beauty and wellness products and services to the public and educate them on why health and beauty is an important aspect of our daily lives. Several activities are lined-up for all visitors. There will also be a lot of FREEBIES for early visitors. 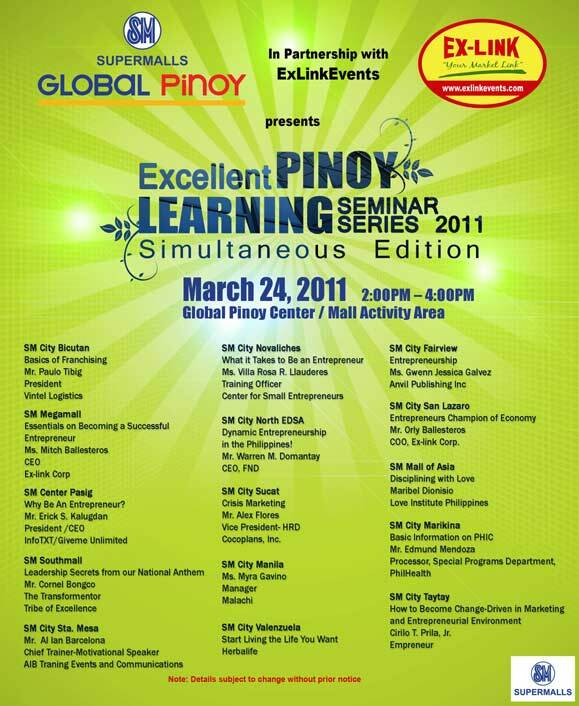 At the comfort of the mall and in celebration of the Migrant's Day, we SM Global Pinoy and Exlink Management and Marketing - an Event Management and Tradeshow Organizer in the Philippines will provide Free Entrepreneurship Seminars in all Metro Manila SM Malls. The event is simultaneously happening in all SM Malls and every OFW and Balikbayan wanting to enrich themselves through learning will be given a valuable treat. The event management and organizer of this gathering have put together a line-up of great speakers all experts in their business and are willing to share their knowledge and expertise. The event is in line with the objective of helping OFWs and Balikbayans to be agents of sustainable economic change by providing them skills, knowledge and right attitudes on starting and running a business. 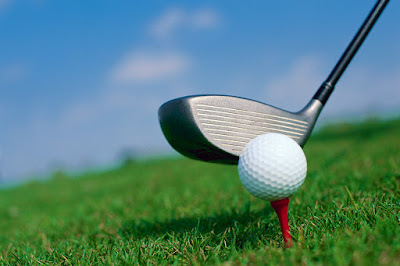 For similar event management activities you may call tel # 643-3887 or visit www.exlinkevents.com. You may also call different SM Malls in Metro Manila for additional information. 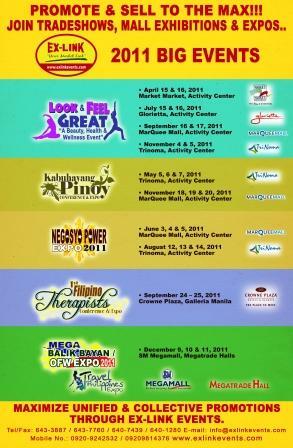 We are very excited to provide you exhibition schedules that you can participate for 2011. As they say the earlier you prepare the better results are produced. There are many reasons why you should join and many reasons why you must not entertain the idea of not joining “Look and Feel Great Event”, an event that is slated to tour all Ayala Malls in Metro Manila. The event will give you exposure MAXIMUM EXPOSURE in the mass market that visits the mall. You cannot achieve it in other marketing tools. Besides, even if you achieve it in other marketing tools but “Look and Feel Great Event” allows you meaningful exposure and other marketing tools pales in comparison to this aspect. The event is a tool that allows you to leverage you promotion. First and foremost it can be a selling strategy; second, it can be a communication strategy or both. 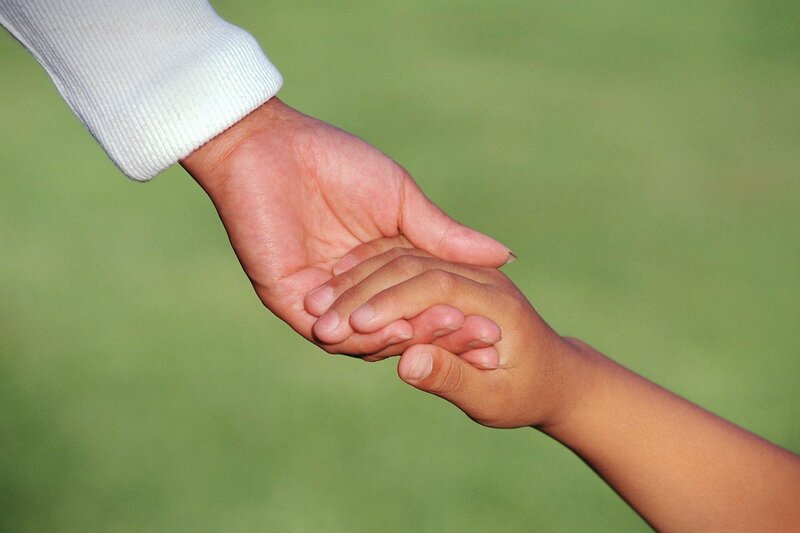 By having these two aspects you would be able to benefit greatly from the event. Give your products and services a great leap forward in terms of goal accomplishment for this year. Are you looking for new partners or clients, the Look and Feel Great Event will surely provide you this. The event is a business event that not only caters for sellers but for buyers or partners that is why you can be assured that after the duration of the event you will have qualified partners that will help you catapult your business to a better level than last year. The event is a marketplace of competing and cooperating products and services. Edward Bono coined it coopetition: competing and cooperating. The event will provide you knowledge on what are the latest moves your competitor is doing. 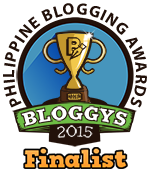 The event is indeed an eye opener that is worth your money and effort. Whatever we do this is the most important part of “Look and Feel Great Event” - the generation of sales. More buyers and more partners mean more sales. More presence in this strategic venue and event means more sales. 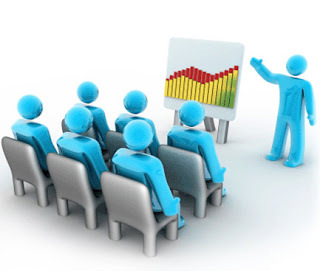 Sales is the lifeblood of the organization and marketing action must convert to sale and we understand this that is why you can feel at ease on us the organizer of the event because we are on the same page when it comes to this aspect. Well, I hope you find the reasons compelling that right now your hand is itching to call us. So call us now, we will be waiting to serve you and give you one of the FEW REMAINING SPACE in the event. 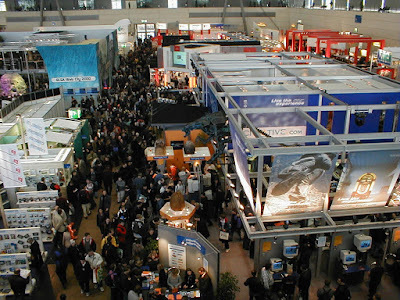 Great promotion await your company as exhibitors and sponsors in this upcoming exhibition schedules.